Remove the cream cheese and sour cream from the fridge a couple of hours before you begin. Preheat the oven to 160°C/gas mark 3. Line the base of a 23cm spring-form tin with non-stick baking paper. To make the base, blend the biscuits in a food processor or crush them finely in a ziplock bag with a rolling pin. Mix with the melted butter, then press firmly into the base of the lined tin and refrigerate for 10 minutes. Using an electric whisk, blend the cream cheese and caster sugar until smooth. Add the eggs one at a time, mixing well each time, then the sour cream, finely grated lemon zest and vanilla until everything is just mixed, being careful not to overbeat. Pour the mixture over the biscuit base, then place the tin on a baking tray and bake for 50 to 60 minutes. The filling should be set but with a little wobble in the centre. Turn the oven off and use a wooden spoon to keep the oven door ajar to allow the temperature to drop slowly. Leave the cake in the oven for several hours, until completely cold, to avoid cracks appearing on the surface. Run the blade of a knife around the edge of the tin to loosen the cheesecake before releasing the catch. This will also help avoid cracks. 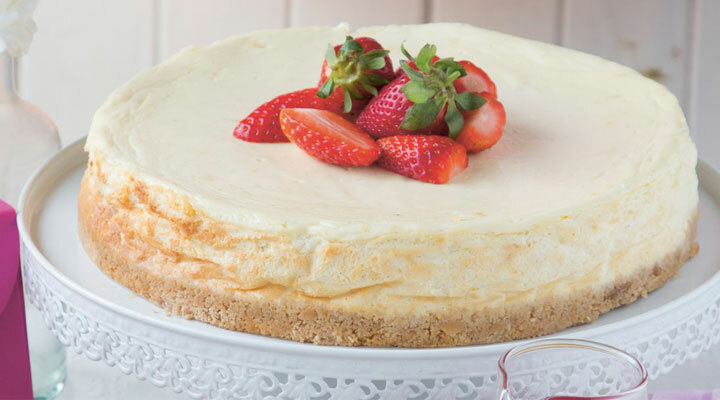 Refrigerate the cheesecake for at least 6 hours or preferably overnight to firm up the texture. Serve with fresh berries and raspberry coulis.